The Program Manager of Softimage Japan talks about his career at Softimage, the Japanese Industry and XSI 4.0. How did you get started in the cg industry? I got interested in computer imagery from a young age, playing with the first video game consoles and personal computers and following the evolution of CG with a deep interest. The “demo scene” development communities for both C-64 and Amiga computers also brought a lot of innovation in realtime graphics synthesis. At University of Montreal I studied computer graphics and did a M.Sc. in human-computer interfaces ( agents ). There, I met Réjean Gagné, Richard Laperrière and Dominique Boisvert, who would later implement the Actor Module in SI3D, and many other friends who were, or are still working at Softimage today. After I completed my studies I got a job interview at Softimage and was hired ; it was a dream come true ! I started in the modeling team, then moved on to motion capture & control, then headed the new Games team and now Special Projects Japan. What do you do on your spare time? I love music very much and I’ve been DJ’ing on and off since the age of 13, so I buy records and practice mixing. I also like programming personal projects, reading, cooking, nature, going out with friends, going to the gym, etc. April 14th 1993 – my first day at Softimage ! solving a data loss problem with an Ascension “Flock of Birds” motion capture system not working properly with a Onyx computer, which was being used at a Jurassic Park theme park at Unviersal Studios. I implemented a fix in Montreal and I was sent to Los Angeles to configure the system. I had a chance to meet the movie actors and Steven Spielberg made an appearance, it was a very impressive “Hollywood” type first experience for me. Fall of 1994, I went to Japan with Daniel Langlois for a 2 weeks business trip, which mutated into a large effort between Softimage and SEGA to create a first generation of 3D game authoring tools. I was called to stay there for nearly 3 months in the first trip, and to frequently pay visits to Japan afterwards. I supervised the project and other developers helped me designing and implementing the features ( 3D paint, color reduction, SEGA Saturn Export / Import and Viewer, raycast polygon selection, etc). It was a very intense and exciting coding experience. Following this, SI3D quickly became the standard for 3D game authoring in Japan. RenderMap – a project which I started after talking to a Japanese game designer, who explained me how he was planning to use clay models to create the characters of his next game. They would scan the clay models into high-resolution polygon mesh models with colors at vertices, and then transform into texture data by rendering front and back view images and re-projecting them on the low-resolution model. With this method there is no control over how the texture is being distributed on the geometry, and although it works for polygons facing the camera, the texturing quality quickly degrades as polygons face at an increasing angle. Instead, I thought it would be better to fire rays along the surface to capture the color information and if those rays could hit a high-resolution version of the object, then we could carry the texturing data from high-res to low-res. RenderMap solved this by using mental ray to fire rays at the intersection of triangles and texels ( according to their location on the object ) and accumulating the weighted color contributions to a final color per texel. You could carry the high-res data to a low-res model, by placing the high-res model in the same location as the low-res one, but making it slightly bigger. Since it uses Mental Ray, it also allows to burn procedural effects into texture maps, generate vertex colors, normal maps, etc. My colleague Ian Stewart implemented the much improved version in XSI. Manta model before applying RenderMap – we can see the results of rendering using mental ray in the render region. Texture data after being pre-rendred with mental ray using RenderMap. Manta model after applying RenderMap. dotXSI file format – an initiative which I launched over 7 years ago, at a time when our customers were asking us to design a high-level 3D data interchange solution. After much discussions with my colleagues in the Games team, we finally opted for using the Microsoft .X format concept, with many new data templates to support a lot of features which were not covered in basic .X files. Since that time, the format has become very popular in the cg and games markets as a generic data interchange solution between authoring tools and pipelines. I was initially hoping to see a good level of popularity one day, but it has now reached well beyond those early expectations. This was also an opportunity for us to understand the fundamental differences between a high-level generic format and an optimized “memory image” data format which can be loaded and used directly by a game engine without further optimizations. From this, we derived our strategy behind the dotXSI file format and the FTK ( File Transfer Kit ), which is a library to read and write dotXSI files and which can be used to write converters between dotXSI files and optimized memory image formats tailored to any custom game engine ( or between any other format and dotXSI ). I came up with the “.XSI” name suffix, which was later adopted by the marketing team for the name of the XSI product itself, although I had no involvement with this decision. Working in Japan: Was it difficult to adjust to a new location and culture? Not really. I got a good experience of Japan during my first trip ; having a routine and working on-site at SEGA was a chance to feel how life would be living here. I came back again on business trips about a dozen times, my interest growing until I relocated in April 99. Adapting to the Japanese culture is a life-long effort, but Japan is very welcoming so this can be relatively painless. Of course I always miss my friends and family, but fortunately I go back a few times a year and we stay conneced by mail and phone. What is the biggest difference when working for a company in Japan compared to Canada? Since I work from home the differences for me are very low. But traditional Japanese companies are more hierarchical than american ones so you have to be aware of that. Also, your ability to connect with a team will completely depend on your ability to communicate in Japanese. Do companies in Japan and Northern America work closely together on projects? Many Japanese companies have branch offices in North-America, however I don’t know how much is new production work, regional adaptation or collaboration on a joint project. How do Japanese customers differ from Canadian customers? The main difference of course is the language. And Japanese companies employ many designers and programmers, so there are many sources of feedback to report issues and submit suggestions for improvements. Sometimes there are misunderstandings, missing information in order to reproduce a problem or understand what a specific request is about or why it’s important, so I keep an eye on all incoming feedback from Japan and work with our support teams in Japan and Montreal and our Japan resellers to make sure we have all the information needed to fully understand and address customer requirements. Another difference is related to the fact that most customers in Japan are game developers. It is normally easier for film companies to switch pipelines from one 3D application to another than for game companies, because the final output for film is a rendered movie while for games is most often data which needs to be compatible with a run-time game engine. A large portion of our customers in Japan are game developers, so they tend to migrate pipelines at a slower pace than for customers in other markets since they need to validate the workflow and data compatibility with a new pipeline before they can adopt it in production. Japanese customers are very thorough in their analysis of new technologies and do not migrate without serious consideration. XSI has already been used in production for a while by many Japanese companies, and its popularity is now accelerating. This is very exciting to see ! When dealing with high profile gaming companies how do you meet their demands for new features that are not implemented? We gather all incoming feedback from Japan, prioritize according to severity, popularity and amount of work involved and then plan the next version features. In cases where a customer requires something which is specific to them, like special training ( features, SDK ), assistance to setup / migrate a pipeline or custom development, then there is always the possibility of purchasing R&D time from Softimage through our Special Projects team. Part of your job is “managing escalation of critical issues”. can you give us an example? If a customer reports something very bad like a production showstopper or something which prevents the adoption of XSI in production, then we may escalate the issue internally and implement a fix which is provided to the customer as a QFE ( Quick Fix Engineering ). This is a service available to customers under maintenance. QFEs done in answer to issues in our last released product are always integrated in the next public release : either a point release ( Service Pack ) or the next main version. Softimage 3D has been a long time favorite by Japanese companies and we are seeing some migration to XSI, Why has it been so hard for them to move to XSI more quickly ? There is a cost involved in migrating since you need to train designers and port your pipeline ( workflow, plugins ) from one application to another. We released our first generation of game tools in SI3D at the time where the 1st generation of game consoles were coming out : SEGA Saturn, Sony PlayStation, Nintendo 64. Since we designed this in conjunction with SEGA, it quickly became the de-facto standard for 3D game authoring in Japan. Then, Alias released Maya in 1998. Although the first version was not ready for production use ( Japanese customers called it “mada”, i.e. “not yet” ), Alias had 2 years to work on Maya until we released XSI 1.0. Of course, we lost some users from SI3D to Maya during this period. It was a hard time for us, but we wanted to build a solid architecture from the beginning rather than something we would need to patch along the way. Now we can see this bet is paying off, as our development speed has greatly improved and is now imposing a pace of innovation which is getting difficult for our competitors to follow. With XSI 4.0 which includes the new poweful and affordable Foundation product, and many new advanced features throughout our product line, we have everthing we need to accelerate the expansion of our user community. What features that you originally developed for SI3D have found their way into XSI? Polygon raycasting, vertex colors, generic user data, polygon reduction, dotXSI support, RenderMap, pipeline tools ( export, viewing ), etc. These were implemented in XSI by my colleagues in Montreal. I wrote a few things for XSI like a User Normal Editing interactive tool and some realtime shader examples which I published on XSINet. Now I am studying the new Xgs and CDH features of XSI 4.0 ( which I think are really cool btw ! ). What features excel in XSI for game companies? 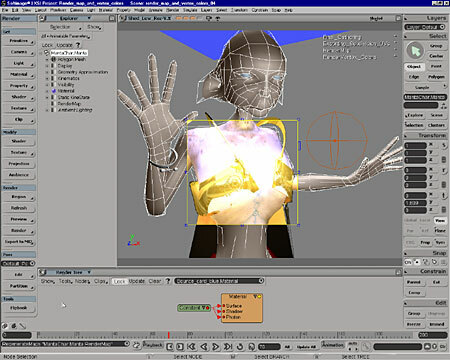 Character modeling and CDK ( Character Development Kit ), polygonal modeling, polygon reduction, texturing, RenderMap / RenderVertex, CDH ( Custom Display Host ) and Xgs ( Graphics Synthesizer ), Realtime Shaders, dotXSI pipeline and FTK, ability to attach generic user data to scene elements and have it automatically supported through the dotXSI pipeline, general ease and flexibility of customization using the XSI Net View, Relational Views, Synoptic Views, and finally, the XSI SDK itself which is rich and now provides strong support for UI customization, among many new things in 4.0. Will 4.0 change the gaming industry in Japan , and gaming industry in general? Definitely. The low price point of our new Foundation product is opening up access to XSI to middle and low-end segments of cg production. It will also become easier for 2nd and 3rd parties to collaborate with high-end clients using XSI on joint projects. As for the features of 4.0, there are many innovations which bring exciting new opportunities to our users. For example, the new rigid body dynamics are based on ODE ( Open Dynamics Engine ), an open source royalty-free solution. It is possible for game users to adopt ODE in their run-time engine and create realtime simulations which are entirely compatible with how things behave in XSI ( or you could simply plot / bake and export the animation if you do not want to recompute it in the game engine ). Also, the CDK ( Character Development Kit ) brings all the tools needed for making custom character animation rigs. The CDH ( Custom Display Host ) allows an external application to communicate with XSI and display its output into a XSI view. It is possible for XSI to drive an external application and vice-verca ; this external application could be a game engine synchronized with XSI, or any custom tool which can be interacted with from within XSI. The Xgs ( XSI Graphics Synthesizer ) allows to create scene-level realtime rendering effects and can communicate with realtime shaders for advanced effects. The Polygon Reduction tool in 4.0 is simply amazing, Texture Layers provide a very powerful workflow for multi-texturing management, Material Libraries simplify material management and the SDK is both rich and powerful. XSI v4.0 is our biggest release ever since v1.0. It contains many other interesting features which are not listed here, as well as a large number of fixes for issues which were reported by our customers around the world. What advice would you give to an artist of Northern America or Europe who wants to start working in Japan? Learn the whole package. Designers in Japan do not tend to specialize in one thing, but instead are called to work on many different aspects of production : modeling, character design, animation, texturing, custom data editing, etc. The more flexible and proficient you are with the package, the easier you will connect with a Japanese production team. Learn Japanese. Even though you can usually always find a few Japanese persons in each company who can speak a good level of English, it is more an exception than the rule and it would be better not to rely on that to bridge the gap with your Japanese colleagues. The better you understand and speak Japanese, the more chances you will have to connect with the team and contribute to the project. An american friend of mine who worked in a game company in Tokyo learned conversational Japanese very quickly because he was completely immersed in a Japanese working environment, but if you can learn some before heading to Japan it will make things a lot smoother and expand your opportunities. This entry was posted in Friday Flashback and tagged history, Softimage, SOFTIMAGE|3D, xsibase by xsisupport. Bookmark the permalink.